When you borrow a ebook from public Library, what you are really downloading is an .acsm file. 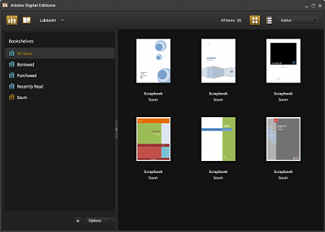 There is a lot of confusion about this file type as the .acsm is not your actual eBook. It is just a link to your eBook that allows a program like Digital Editions to download the actual book, The idea that you could convert an .acsm file to a .pdf file is based on the assumption that the .acsm file contains all the text of a book, and that it’s just in the wrong format. That might be true if it was a .doc file, or any other text-based file. That is not what an .acsm file is. 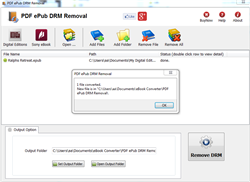 When Digital Editions sees the .acsm file it will automatically download the PDF or ePUB file, which is the actual eBook, so you only remove drm from epub/pdf file, not from .acsm file, This is how to remove drm from epub/pdf file. 2). Open .acsm file in digital editions, When Digital Editions sees the .acsm file it will automatically download the PDF or ePUB file, which is the actual eBook, and then unlock the file’s DRM so that it becomes readable. At this point you should be able to read the library book in Digital Editions. 4). 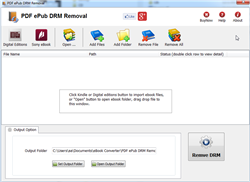 Run PDF ePub DRM Removal, it is easy to use, select ebook file to decrypt, click “Digital editions” button to import ebook files. 6) Once find decrypted ePub/PDF file in Windows Explorer, you can upload it to e-reader device or convert to other format, enjoy reading.